SOLANA BEACH, Calif. - June 7, 2018 - PRLog -- Excitement has been running so high for North Coast Rep's Season 36 closer, A FUNNY THING HAPPENED ON THE WAY TO THE FORUM. The theatre has already extended the beloved musical by one week to accommodate the ticket requests. Composer Stephen Sondheim has created a laugh-a-minute audience favorite with songs such as "Comedy Tonight," "Lovely" and "Everyone Ought to Have a Maid." Winner of six Tony Awards including Best Musical, FORUM was written by Burt Shevelove and Larry Gelbart, who based their farce on the over-the-top antics of the Roman slave Pseudolus, who will do anything to win his freedom and bring two lovers together. Tickets are already flying out the door, so it's best to order early. David Ellenstein directs. Andrew Ableson,* Melinda Gilb,* John Greenleaf,* Luke H. Jacobs, Chris M. Kauffmann,* Kevin Hafso Koppman,* Jason Maddy,* Missy Marion, Noelle Marion,* David McBean,* Amy Perkins, Omri Schein,* and Jean Schroeder*. The design team includes Marty Burnett (Scenic Design), Matthew Novotny (Lighting Design), Name (Sound), Elisa Benzoni (Costumes), and Holly Gillard (Prop Design). Cindy Rumley* is the Stage Manager. *The actor or stage manager appears through the courtesy of Actors' Equity Association, the union of professional actors and stage managers in the United States. For background information and photos, go to www.northcoastrep.org/press. 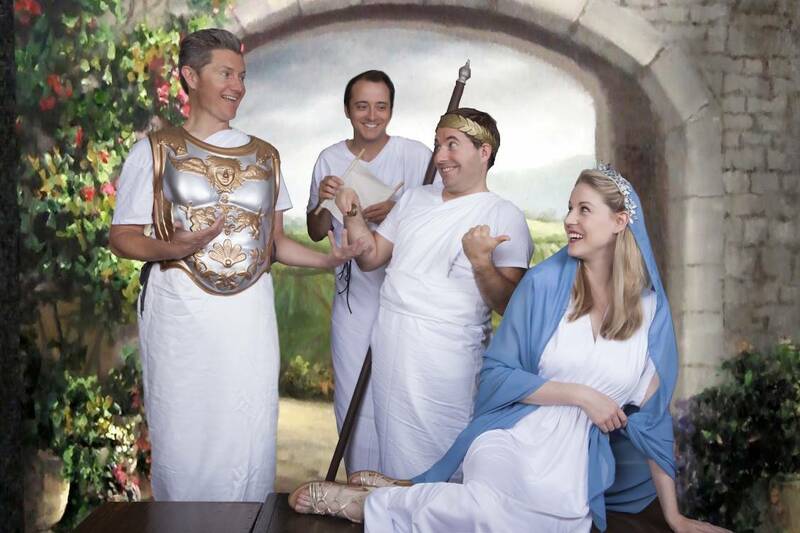 FORUM previews begin Wednesday, July 11. Opening Night on Saturday, July 14, at 8pm. There will be a special talkback on Friday, July 20, with the cast and artistic director. It will play Wednesdays at 7pm, Thursdays through Saturdays at 8pm, Saturday and Sunday matinees at 2pm with Sundays at 7pm, through August 19, 2018. North Coast Repertory Theatre is located at 987 Lomas Santa Fe Drive, Solana Beach, CA 92075. Tickets: Previews- $45, Week Nights - $52; Sat. Eve. & Sun. Mat. $56; Sat. Mat. & Sun Night - $49. Seniors, Students, Military & Educators - $3 off admission. There is also a $20 rush for tickets 15 minutes before performance if available. Call 858-481-1055, or visit www.northcoastrep.org to purchase tickets.